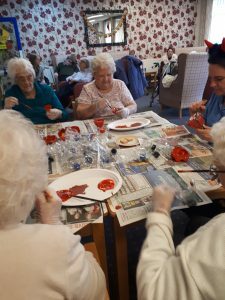 From pop to poppies – plastic bottles were recycled into hundreds of poppies in one of several very special acts of remembrance at the Princess Alexandra Home for the Blind at Squires Gate. The project, which has spanned weeks, also marked new life, the birth of a great-granddaughter for one of the residents taking part – and the little girl has been named Poppy. The plastic poppies created and crafted by residents were pinned onto camouflage netting, weighted with sandbags, draping the twin pillars of the entrance to the home run by n-Vision, the Blackpool Fylde and Wyre Society for the Blind, at Bosworth Place. Care workers cut empty plastic water and pop bottles and then applied heat to shape the poignant petals. Bottle tops formed the heart of the poppies. Men and women at the home, including some who served in the Second World War and others who had lost loved ones to both World Wars, shared their own memories of those distant, yet never forgotten, days as they carefully painted the poppies blood-red and dark of heart, before assembling them. One of the former servicewomen served in the WRNS, while her husband flew a military glider in the specialist airborne regiment formed by order of Winston Churchill to deliver men, weapons and even tanks to designated landing zones in the thick of the action using stealth, silence and the element of surprise. Care services manager Elaine Wright said the project had thoroughly engaged staff, support workers, volunteers and residents of the home in a “shared act of Remembrance” as part of the home’s own commemoration of the centenary of the Armistice. Links to the project taking shape were featured on the charity’s Facebook and Twitter pages, on Instagram, and on an online regional business, health and charity magazine. Other severely visually impaired men and women living independently in the community but visiting the social hub Sharples Hall for activities and socialising took part in another poppy project under the same roof – knitting 300 of the 30k poppies which currently adorn a replica of the Menin Gate in the main entrance of Blackpool Victoria Hospital. And it was an honour and a privilege for our charity to attend the service of Remembrance at the hospital in the company of our blind veterans Marjorie Hanson, Fred Porter and Tom Lavelle (pictured by our Eye Clinic Liaison Officer Linda Sethi).